Decorating Easter eggs was more than a fun holiday activity at our house, it was a full-on art project. When the kids were very little, it was as simple as using crayons and stickers to create their designs. 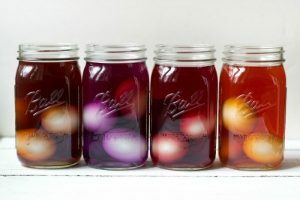 As they grew and needed less hands-on help, we gathered around cups of jewel-toned water made with store-bought dye kits or joined friends to make Ukrainian Easter eggs (shown below). They’re grown now, but I can still see their faces, wide-eyed and ready to witness the transformation from egg to art. This collection of ideas is appropriate for a wide range of ages and half of them remain edible. 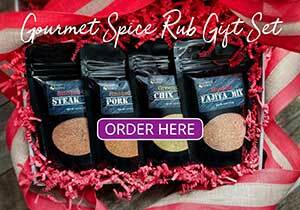 Click on the numbered titles to learn more! Onion skins create marbled, antique hues that look like glass when polished with a bit of oil. 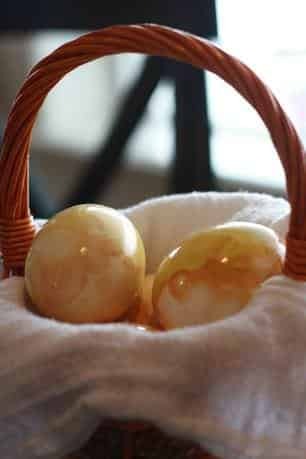 These naturally decorated eggs are so beautiful you can use them as an elegant table centerpiece as well. I love the idea of using homemade natural dyes because it makes it an art project and a science project! This method by Real Food Real Deals is also ideal for anyone with sensitivities to artificial colorants and dyes. 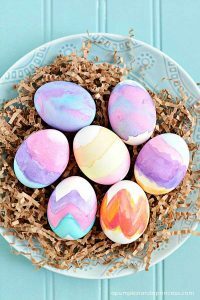 This super easy way to color eggs by It’s Always Autumn is especially neat and tidy when little hands are involved. Nothing to spill or slosh and you’ve probably already got everything you need at home if your kids already use markers. Coloring Easter eggs with markers. These watercolor Easter eggs by A Pumpkin & A Princess are simple, allowing for any design your little artist can dream up! A few simple steps and they’ll be coloring eggs with ease. 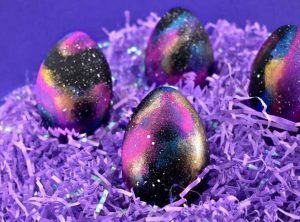 Though any design is possible, these bold galaxy eggs by Dream a Little Bigger bring the WOW every time! The step by step tutorial makes this a do-able project for anyone. Galaxy Easter eggs using craft paint. If you need to “just get it done”, Uncommon Designs shows you how to have stunning eggs in just 5 minutes. Butterflies, puppies, smiley faces, dinosaurs … so many styles, so easy to do! Are you into wild stripes and ultra-easy clean up? 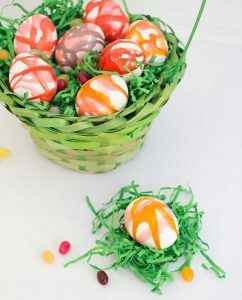 Then this egg coloring technique by Freutcake will set you up. It’s still advisable to wear an old shirt, but these are easy for any age. Using Kool-Aid to color Easter eggs. 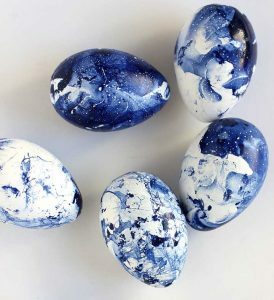 These gorgeous Indigo marbled eggs are eye-catching, decorating brilliance with this nail polish technique by Alice and Lois. Their drying rack idea is genius too. Washi tape gives you the flexibility of embellishing already dyed eggs or using the tape all by itself to create your egg designs. 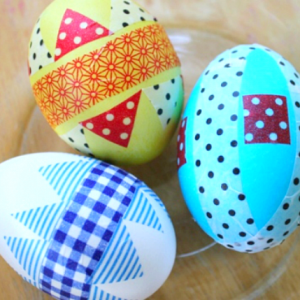 Decorated Easter Eggs with Washi Tape. 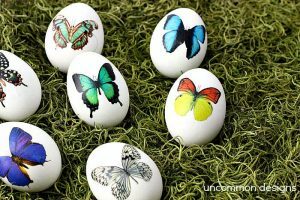 My friend Mary hosted a week-long Ukrainian egg decorating party at her house every year. This was such a treat for me and the kids! The challenge of intricate, layered designs was inspiring. It’s a bit more involved to set up with the dyes, beeswax, candles, and special kistka tools, but so worth the investment and effort. The pysanky dyes are incredibly rich and vibrant—this hurricane vase filled with our beloved projects is always on display in our home. 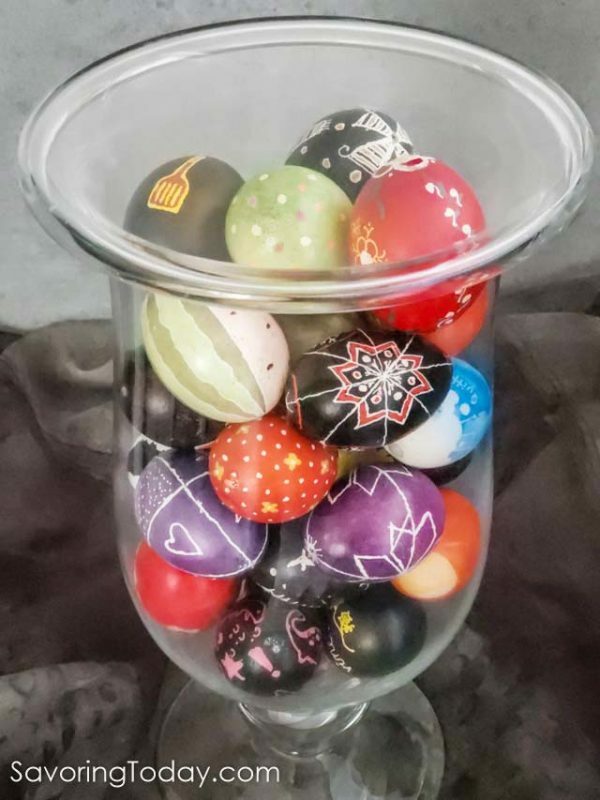 Note: Don’t eat eggs decorated with pysanky egg dye and young children should be monitored very closely when using it. I’m basically a kid, so these ideas definitely appeal to me. 🙂 Fun post — thanks. Well you have the egg decorating covered with all these suggestions…really nice. I never knew there are diffent ways of dying an egg, I thought you just paint on it and presto! The brand I used was a Romanian one, well known and used here. I wish you and all your viewers a wonderful, peaceful and relaxing Easter! So thank you again for this lovely article and hope to “see” you soon! 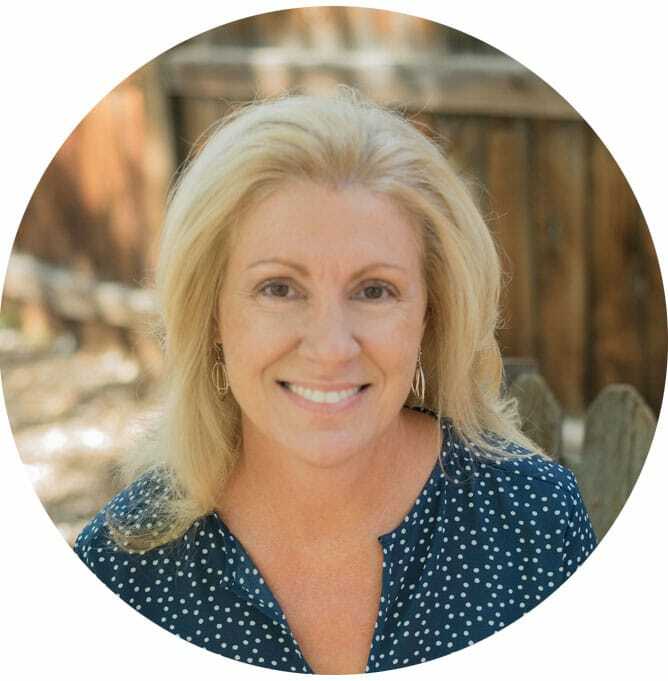 Hi Droopina, it was a pleasure to feature your blog today, thanks for stopping by. I was wondering about the dye you use, I couldn’t tell what brand it was from the package to research it myself. Folks are becoming more aware of food dyes in their food these days and I wasn’t sure if boiling the eggs in the dye made any difference in being able to eat them–thanks for clearing that up. 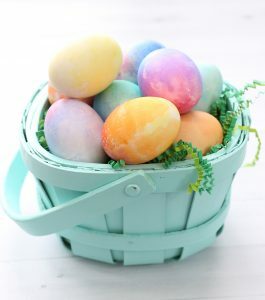 Personally, we have never eaten the eggs we dye at Easter because they sit out for so long ;). Hope you have a wonderful Easter!